Essentially all modern rosaries, and a good many historical ones, have their ordinary beads divided into groups. Between each group there is a "marker" bead that is somehow "different" -- larger, a different shape, of a different material, or set off by caps, accessory beads, or additional space on either side. These marker beads are called "gauds," from a word meaning decorations or ornaments. The most common number of beads in a group is ten, not counting the gaud -- the ten being referred to as a "decade." In the modern rosary, the prayer "Hail, Mary, full of grace..." is said on each bead of the decade. After ten repetitions, one for each bead, the prayers "Glory to the Father..." and "Our Father, who art in heaven" are said. 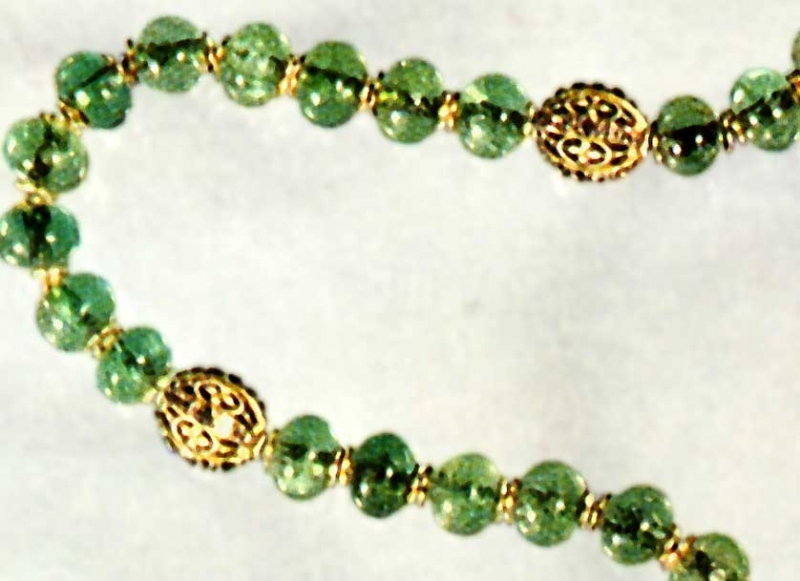 The ordinary beads are the "Ave" beads (from "Ave, Maria," the opening words of the "Hail Mary" in Latin), and the gauds are sometimes called the "Pater" beads (from "Pater noster..."). However, beads aren't always in tens. Aside from the modern rosary, there have always been a number of other devotions that use a string of prayer beads, and the numbers are often different. The "Rosary of the Five Wounds," for instance, may use a chaplet with five groups of five beads, and common chaplets for other devotions may use groups of three, seven, nine, fifteen, or just about any other number. For historical rosaries the evidence is hard to decipher. The most trustworthy evidence comes from documents, especially instructions for praying various sorts of rosary, which detail exactly which prayers to say and how many of each. Working from other sources of evidence is more problematic. There are very few surviving rosaries that we can be sure have not been re-strung -- and these may or may not preserve their original arrangement. Similarly, paintings and engravings may or may not be accurate in the number of beads they show. 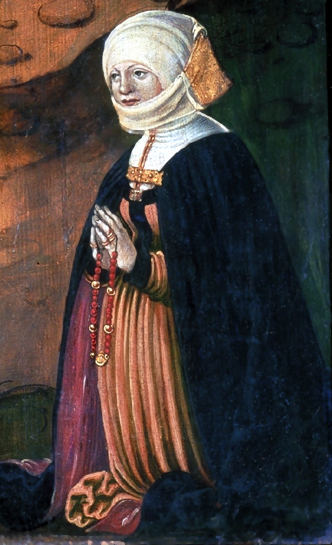 Painters may often have aimed more to present the idea "this is a rosary" than to reproduce exactly the beads (if any) that they saw. "...And paternosters ought to have fair marker beads of gold, or else beads all of gold in their substance, and enamelled on gold with *rouge cler* [a particularly expensive type of red enamel]. You must not stint your treasure on them, for there ought to be some signal difference in the marker beads." Here are some examples of the bead materials and combinations I've found so far, in order (or so I think) of social rank from lowest to highest. WOOD: Aves of wood have gauds usually of wood, but one example has silver gilt, one unusual set has enamelled gold. BONE: Gauds of the same, or perhaps glass. GLASS: Gauds of the same; one example with silver-gilt. MOTHER OF PEARL: One example has markers of coral. AGATES: Gauds of the same, one mention of silver-gilt. JET: Gauds of coral, silver-gilt, or of gold and pearls. AMBER: Gauds of amber, coral, pearls, or gold. CORAL: Gauds of rock crystal, silver, silver-gilt or gold. ROCK CRYSTAL: One example has gauds of gold. SILVER: Gauds of the same, or of silver-gilt; there are also sets of beads all of silver-gilt (both Aves and gauds). GOLD: Anything goes, including gauds of pearls, of enameled gold, even of balas rubies and sapphires. PEARLS: Interestingly, gold and pearls seem to rank about equally: we see beads of gold with gauds of pearls, and also beads of pearls with gauds of gold.